Monona Terrace Community and Convention Center opened its doors after nearly 60 years of debate on July 18, 1997. It was first designed by Wisconsin native and internationally-renowned architect Frank Lloyd Wright in 1938 as a cultural, governmental and recreational building. Frontier Airlines Center Computer and Audio Visual Rentals ConventionVendor.com is an independent nationwide supplier of short term computer, audio visual and trade show equipment rentals. It has always been our great pleasure to offer these services to those attending Milwaukee's most notable convention venue better known as the Frontier Airlines Center. 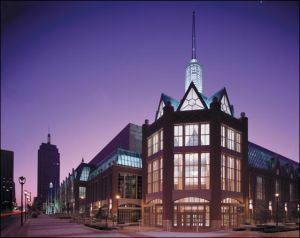 The Frontier Airlines Center offers one of the best meeting solutions in all of Wisconsin and is one of the largest convention centers in the state. The Center is also one of the most architecturally exhilarating convention centers in the United States. With over 188,500 square feet of total meeting space, the Frontier Airlines Center is big enough to accompany even the largest meetings and conferences. So if you are planning a trip to the Frontier Airlines Center, or any destination in Wisconsin, relax and let your Tech Travel Agent book your next computer or audio visual rental need. Our Tech Travel Agents can reserve the computer or audio visual hardware you need for your Milwaukee trade show, conference or event. Even if you are thinking of a small laptop rental, projector rental, plasma rental, or any other single unit short term rental from ConventionVendor.com this can be an intelligent choice as it saves you the worry and hassle of equipment damage and transportation to and from your event. *ConventionVendor.com is not affiliated with or in any way authorized by the Frontier Airlines Center. ConventionVendor.com is an independent nationwide technology rental provider and this page in no way implies exclusivity of service to the Frontier Airlines Center.